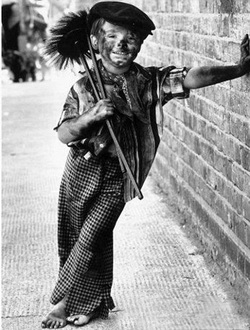 'The Chimney Sweeper' is the title of two poems written by 'William Blake'. 'William Blake' (28 November 1757 – 12 August 1827) was an English poet, painter, and printmaker. Largely unrecognised during his lifetime, Blake is now considered a highly influential figure in the history of both the poetry and visual arts of the Romantic Age. The first poem was published in 'Songs of Innocence' in 1789 and the second poem was published in 'Songs of Experience' in 1794. The time in which 'Blake' wrote his poems is called the Romanticism era. On this website you'll find assignments about these two poems. You'll have to work for approximately two hours on these assignments. The last assignment is to write an essay. I hope that you'll have fun while reading these poems. Please continue with assignment one.